Siwertell’s ability to combine market-leading loading and unloading performance in a single machine provided the perfect solution for the flue gas processing plant at a new power-generating facility in the US. 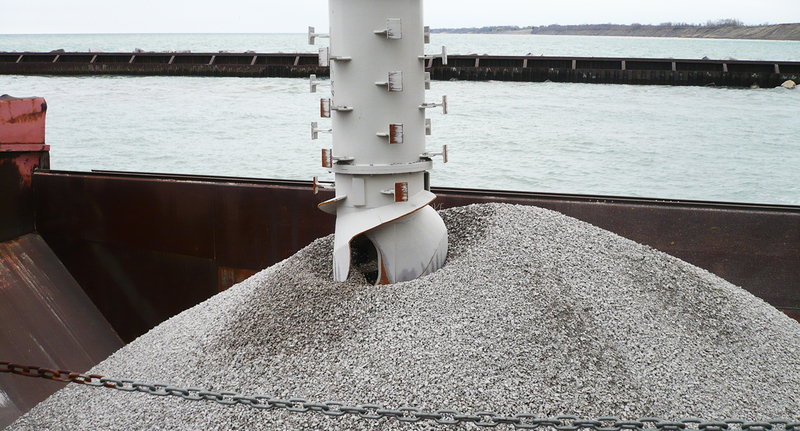 Bechtel Power Corporation needed to unload bulk limestone for cleaning the flue gas produced by its new coal-fired power plant in Oak Creek, Milwauke, Wisconsin, USA. A by-product of this cleaning process is gypsum, which is used in building products. for many of the component parts. 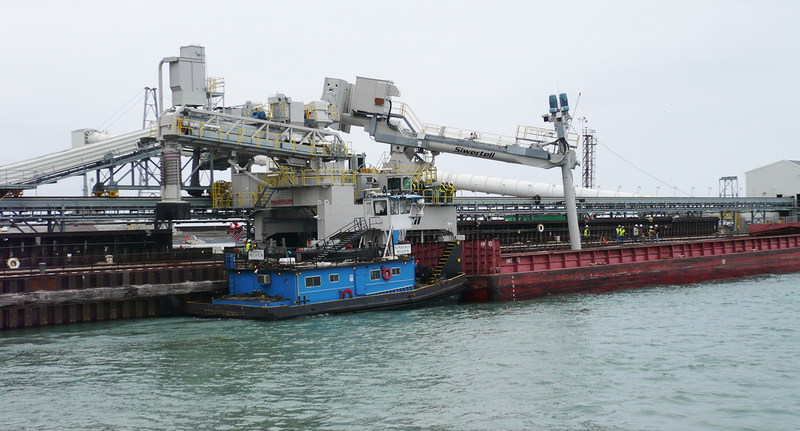 A machine with combined loading and unloading capabilities offered the ideal solution; requiring a smaller investment than two machines and less space on the jetty. 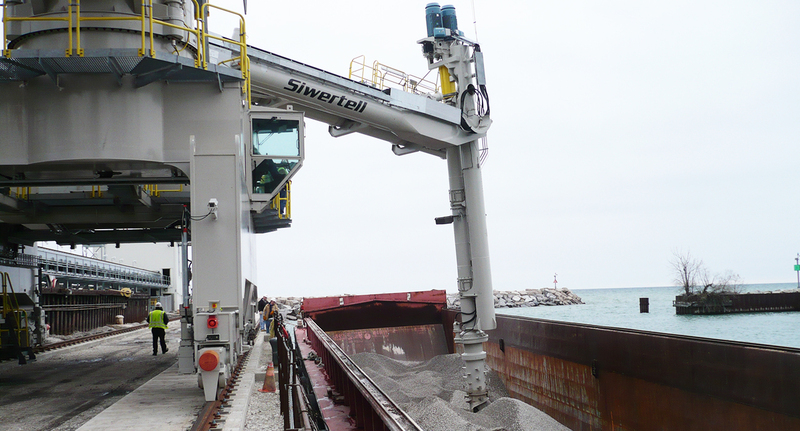 After considering alternative proposals, Bechtel settled on an ST 640-type machine from Siwertell, capable of unloading limestone and loading gypsum without any adjustment. Unloading from barges is carried out by a Siwertell screw conveyor system, well-known for its reliability and clean operation. The loading boom employs a belt conveyor and a special loading chute. Loading and unloading elements are equipped with dust collectors that create negative pressure in the conveying lines, guaranteeing dust-free operations. In addition to these advantages, Bechtel chose the Siwertell loader/unloader because the price was competitive and it was impressed by recommendations from satisfied Siwertell Customers. The machine was delivered as component parts in 2007. Using the same gantry for the loader and unloader means the width of the unit is only about half that of two separate systems. It became operational in 2009. Bechtel says it meets all the loading and unloading capacity requirements. The unit delivers a clean working environment in compliance with all relevant regulations. The air-conditioned operator cabin provides full visibility into the barges. 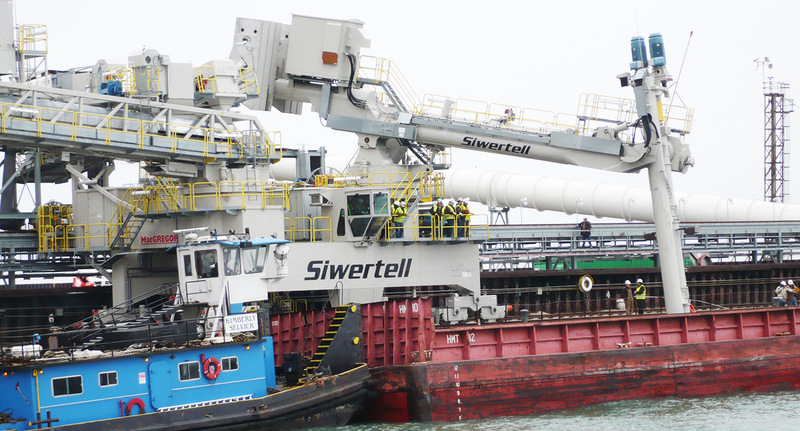 The unloader’s horizontal boom is equipped with a 10-tonne capacity auxiliary hoist for lifting front loaders into the barge for use during final clean-up. The demand for combined machines is limited and this delivery demonstrates Siwertell’s determination to provide tailor-made solutions that exactly meet customers’ requirements.